In deference to my degrees in mathematics and analytical pursuits--such a necessity for the spiritual journey--I share with you some thoughts on the anomaly of this "in between" week. Up until the 1930s Thanksgiving was not celebrated on a universal day. Some states celebrated it on the fourth Thursday in November, some on the last. But at the urging of President Franklin D. Roosevelt, and the business community, Congress passed a law in 1941 setting the fourth Thursday, not the last Thursday in November, as the official Thanksgiving holiday. Since then we know that Thanksgiving will fall on any of the seven days from November 22nd through the 28th. My own parents were married on the last possible day, but I knew a teacher who was also married on Thanksgiving on November 30th...in the 1930s! This Thanksgiving reflection is just a warm up to the same idea on the First Sunday of Advent. Advent's beginning is always between November 27th and December 3rd. In five of those cases (November 27th-December 1st) it falls on the Sunday of the Thanksgiving weekend. (Are you still with me or even interested?!!) Just joking; I can throw in the Pythagorean Theorem if you wish, giving you one more chance to master it before too much longer. To continue: When the First Sunday of Advent falls on December 2nd or 3rd, there is a week between Thanksgiving and the beginning of the Advent season. Ta da: 2012. Now, I'm not quite sure what the conclusion to all this is, it's just something to notice. Personally I do have a favorite combination which occurred just last year. Thanksgiving was on November 24th and Advent began November 27th. It is my favorite because we had four full weeks of Advent, with Christmas also on a Sunday. If you are into the liturgical calendar even in the slightest it may be your favorite, too. So anyway, back to reality. 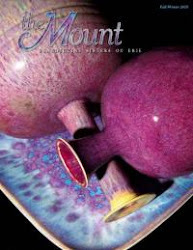 Here we are in the last week before Advent but our thoughts are already turning toward it here at Mount St. Benedict. Temperatures have plummeted this week and snow flurries have been with us: soon to become real snow flakes and accumulate surely. The nights are longer and darker every day and I know that the pre-Advent liturgical signs will start to show as the week goes along. One final thought (thanks for persevering through all this! ): the holiday cacti are blooming all over the house now. Here are two quite opposite ones: the white one is very small and delicate, the red/pink one is huge and overgrown. Yet, both were used in our Sunday chapel decor yesterday and were just beautiful.